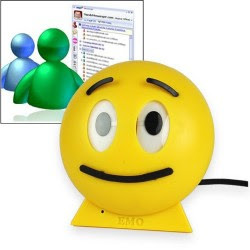 EMO is a smiley-face shaped desktop gadget which expresses the emoticons that you send or receive in your Windows Live Messenger conversations. The living smiley moves his eyebrows, his eyes and his mouth. The living emoticon Emo reacts on emoticons which you receive via Windows Live Messenger and you can can set all by yourself what the reaction of Your Emo is by sending different emotions. Emo can also talk, plays movies which you receive from friends. The EMO ball will connect to your computer via USB and it supports Windows Live Messenger only. EMO is currently available to order in Holland only and it has a cost of €29,95. WLM Doesn't Remember Your Login Details ?